﻿ Sustainable water treatment no wear parts, no chemiclas. Sustainable Water Treatment what is the meaning? To provide water treatment and treatment of other liquids, without chemicals and minimum input of energy and raw material. And herewith achieve a maximum results for the customers benefit mainly in water, crude oil and natural gas, and the environment. We believe that respect is the core to sustainable success. This includes both, respecting people and nature. The Merus technology influence as less a possible, the to be treated water. Nothing is added to the water or removed. The water remains chemically unchanged and stays stable. When using a watersoftener, one can not tell it is sustainable. There is salt added to the water to change the calcium against the sodium. This salt stays in the water and will end in a wastewater plant where it has to be removed again. This is true more or less for all kind of chemical watertreatment. The Merus Rings instead ore only carrier of effect oscillations. The Aluminium Ring will usually not break, the ring can be reused several times. 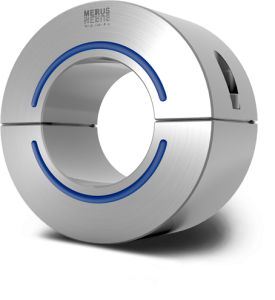 The Merus Rings dont need electricity to function, neither are wearables inside. Only for the production of the ring itself, there is one time energy used. All this is a clear indication for a sustainable water treatment. After the 30 years war, around the year 1650 big parts of southern Germany have been totally destructed. The forest were cut down, there was not enough fire wood or wood for construction. At this time people came up with the 3 generation model. The grandfather is planting a tree, the father is taking care about the tree and the son is allowed to harvest the tree. This methode is used very succesfully until today, and the concept is given from one generation to the next. If all act in accordance to this rules, it can be assured, there will be always enough trees. In our opinion here it can be clearly seen, how important sustainable behavior is. The rivers in Europe are another good example. In the sixty or seventy years, the main rivers in Germany like Rhein, Ruhr or the Elbe has been so much polluted, one could hardly find a fish in the water and swimming was considered as very dangerous to health. Over time and with industrial prosperity came people to the conclusion, using sustainable watertreatment will make the rivers clean again. In other words, water was less polluted from the beginning or better cleaned before going back to the rivers. Today fishes are back and swimming is possible without any problem.